Today I'm prepping for a workshop I'm holding tomorrow with Lili and Natasha. I'm going to be showing them how to do the marker layering technique (coloring with a blender pen). I just love this technique and have used it a LOT since I watched Karen Barber's video tutorial on Splitcoast Stampers. I used a larger image than normal for this technique and I learned a few things along the way. First of all, I found it easiest to actually use a wash for the first layer of color (or use a very pale colored cardstock if you have it). With today's rose, I mixed Pumpkin Pie re-inker with water and then used a paint brush to add a "wash" as my first layer. And, I found the blending worked better if, after adding the darkest color and blending (I used three colors in total), I went back and added more of the medium shade to blend out the dark edges. At least, that's what worked best for me. Hope you like. 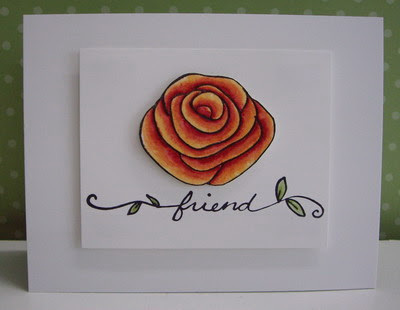 Using StazOn Black ink, I stamped the rose onto watercolor paper, and the sentiment onto my Whisper White card front. I used Certainly Celery and Old Olive Stampin' Write markers to color in the leaves, blending the ink with the blender pen. I added a bit of water to Pumpkin Pie re-inker and then used a paint brush to "wash" the rose. I used Tangerine Tango and Real Red Stampin' Write markers to add layers of color to the rose petals, blending them with the blender pen. I went back and added more Tangerine Tango to blend out the sharpness of the Real Red ink. **NOTE:** When adding Real Red, I used the fine tip of the SWM to add only a little ink so the red didn't overwhelm the image. I cut the image out. I mounted everything as shown in the photo, popping up the sentiment panel and also popping up the rose to give it lots of depth. The card front was mounted onto an Old Olive card base for stability. Gorgeous marker layered card Loll. Have you ever tried EB your image onto watercolor CS and then watercoloring your lightest color. Then marker layering the final med. and dark colors? beautiful Loll! loved reading how you did it! Is there a link to this tute? thx!